Swindon beat holders Southampton to reach the second round of the Johnstone's Paint Trophy. Former Southampton loanee Vincent Pericard struck a crisp volley to put Swindon ahead in the first half. Charlie Austin extended their lead after the break, finding the net with his well-executed shot. The misery continued for managerless Saints when sub Lee Barnard was sent off for a tackle on Will Evans and Pericard sealed the win in added time. "I'm disappointed with the end result because we were defending our trophy. "We're all professionals and I'm not going to use it (Alan Pardew's departure) as an excuse. "We lost the game in both penalty areas, I thought our play in the middle third was better than theirs. "We felt we had a good chance of going all the way again." "When you put in a performance like this is gives you great hope that you're not far away from where you want to be. "Every aspect of our game tonight was fantastic - the work ethic, the defensive duties that everyone put in and the attacking and counter-attacking game we played. "We've got Vincent (Pericard) on the score sheet and that's a massive bonus for us." 90:00+1:45 Assist by Simon Ferry. 90:00+1:45 GOAL - Vincent Pericard:Southampton 0 - 3 Swindon Vincent Pericard grabs a goal from inside the penalty box to the bottom right corner of the goal. Southampton 0-3 Swindon. 88:43 The ball is sent over by Alex Oxlade-Chamberlain, save made by David Lucas. 88:12 Ryan Dickson sends in a cross, Callum Kennedy manages to make a clearance. 87:18 Shot from deep inside the area by Alex Oxlade-Chamberlain clears the bar. 85:53 The ball is crossed by Alex Oxlade-Chamberlain, clearance made by Sean Morrison. 84:38 The referee blows for offside against Vincent Pericard. Kelvin Davis takes the free kick. 84:15 Corner taken short by Jon-Paul McGovern. 84:02 The ball is swung over by Michael Timlin, Jose Fonte gets a block in. 83:13 Sent off Lee Barnard is sent off by the referee for second bookable offence. Correction - 82:58 Free kick awarded for a foul by Lee Barnard on Will Evans. Scott Cuthbert takes the direct free kick. 82:58 Will Evans fouled by Lee Barnard, the ref awards a . 82:58 Booking Booking for Lee Barnard for unsporting behaviour. 80:05 Corner taken by Dan Harding, Shot by Radhi Jaidi from deep inside the penalty area misses to the right of the target. 80:05 Substitution (Swindon) makes a substitution, with Alan O'Brien coming on for Charlie Austin. 79:50 The ball is sent over by Lee Barnard, clearance by Sean Morrison. 79:28 Callum Kennedy crosses the ball. 79:21 Jon-Paul McGovern produces a cross. 78:51 Outswinging corner taken by Jon-Paul McGovern from the right by-line played to the near post, clearance by Morgan Schneiderlin. 78:30 Kevin Amankwaah takes a shot. Dean Hammond gets a block in. 77:35 Vincent Pericard concedes a free kick for a foul on Jose Fonte. Morgan Schneiderlin takes the free kick. 77:21 Vincent Pericard challenges Radhi Jaidi unfairly and gives away a free kick. Jose Fonte takes the direct free kick. 76:26 The offside flag is raised against Charlie Austin. Indirect free kick taken by Kelvin Davis. 73:22 Substitution Lee Barnard comes on in place of Danny Butterfield. 73:22 Substitution Ryan Dickson comes on in place of Guly Do Prado. 73:12 Michael Timlin sends in a cross. 72:07 Corner taken right-footed by Jon-Paul McGovern from the right by-line, Radhi Jaidi manages to make a clearance. 71:44 Alex Oxlade-Chamberlain takes a shot. Scott Cuthbert gets a block in. 70:37 Inswinging corner taken from the left by-line by Morgan Schneiderlin. 70:26 Guly Do Prado produces a cross, blocked by Jon-Paul McGovern. 69:47 Free kick awarded for a foul by Vincent Pericard on Jose Fonte. Kelvin Davis takes the direct free kick. 69:00 Jon-Paul McGovern takes a corner. 68:01 Unfair challenge on Charlie Austin by Jose Fonte results in a free kick. Callum Kennedy fires a strike on goal direct from the free kick, save by Kelvin Davis. 68:01 Booking Jose Fonte is given a yellow card. 66:48 Free kick awarded for an unfair challenge on Charlie Austin by Radhi Jaidi. Direct free kick taken by Scott Cuthbert. 65:39 Headed effort from deep inside the area by Charlie Austin misses to the right of the target. Correction - 65:10 Morgan Schneiderlin concedes a free kick for a foul on Vincent Pericard. 65:10 Foul by Morgan Schneiderlin on Vincent Pericard, free kick awarded. Scott Cuthbert takes the free kick. 64:22 Jose Fonte concedes a free kick for a foul on Vincent Pericard. Callum Kennedy takes the free kick. 63:51 Dean Hammond has an effort at goal from outside the area missing to the wide left of the goal. 62:56 Substitution Alex Oxlade-Chamberlain is brought on as a substitute for Jason Puncheon. 62:25 Kevin Amankwaah provided the assist for the goal. 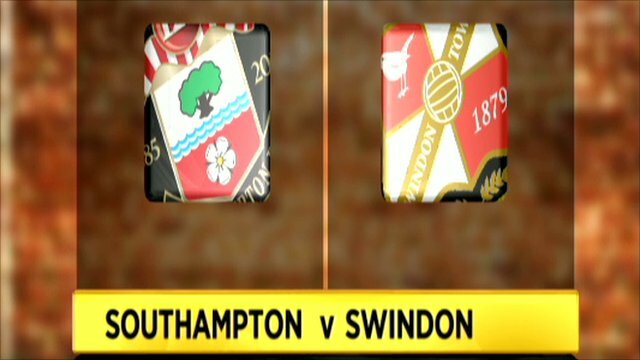 62:25 GOAL - Charlie Austin:Southampton 0 - 2 Swindon Charlie Austin fires in a goal from close range to the bottom right corner of the goal. Southampton 0-2 Swindon. Correction - 61:45 Guly Do Prado challenges Kevin Amankwaah unfairly and gives away a free kick. Free kick taken by Scott Cuthbert. 61:45 Free kick awarded for a foul by Guly Do Prado on Kevin Amankwaah. Free kick taken by Scott Cuthbert. 61:27 The ball is swung over by Danny Butterfield, clearance by Jon-Paul McGovern. 58:13 Shot by Richard Lambert from outside the box goes high over the target. 56:35 Foul by Charlie Austin on Kelvin Davis, free kick awarded. Kelvin Davis takes the direct free kick. 55:00 Guly Do Prado is flagged offside by the assistant referee. David Lucas takes the free kick. 54:43 Richard Lambert fouled by Michael Timlin, the ref awards a free kick. Jason Puncheon takes the free kick. 53:47 Inswinging corner taken by Morgan Schneiderlin from the left by-line played to the near post, David Lucas makes a comfortable save. 53:36 The ball is delivered by David Connolly, clearance by Sean Morrison. 52:26 The ball is sent over by Callum Kennedy, Radhi Jaidi manages to make a clearance. 52:02 Charlie Austin delivers the ball, clearance made by Jose Fonte. 50:35 The ball is crossed by Dan Harding, clearance by Jon-Paul McGovern. 49:05 Corner taken by Morgan Schneiderlin, Radhi Jaidi produces a right-footed shot from inside the area that clears the crossbar. 48:24 Unfair challenge on Dan Harding by Charlie Austin results in a free kick. Kelvin Davis restarts play with the free kick. 48:24 Booking Charlie Austin goes into the referee's book. 47:24 Effort from 6 yards by David Connolly. David Lucas makes a save. 46:24 The assistant referee signals for offside against Vincent Pericard. Indirect free kick taken by Kelvin Davis. 46:12 A cross is delivered by David Connolly, clearance made by Sean Morrison. 45:15 Centre by Guly Do Prado. 45:00+1:39 The half-time whistle blows. 45:00+1:10 Dan Harding produces a drilled right-footed shot from 12 yards. Save made by David Lucas. 45:00+0:06 Will Evans concedes a free kick for a foul on David Connolly. Morgan Schneiderlin takes the free kick. 44:48 Will Evans takes a shot. Save by Kelvin Davis. 44:19 The ball is sent over by Kevin Amankwaah, Will Evans takes a shot. Danny Butterfield gets a block in. 43:46 Corner taken by Jason Puncheon from the left by-line to the near post, Charlie Austin manages to make a clearance. 43:24 Shot from 20 yards by Jason Puncheon. Callum Kennedy gets a block in. 41:54 The ball is swung over by Jason Puncheon, Header from deep inside the area by Richard Lambert goes over the bar. 39:52 A cross is delivered by Callum Kennedy. 37:16 Guly Do Prado gives away a free kick for an unfair challenge on Kevin Amankwaah. David Lucas restarts play with the free kick. 36:51 The referee blows for offside. Kelvin Davis restarts play with the free kick. 34:50 The offside flag is raised against Richard Lambert. David Lucas takes the indirect free kick. 34:41 The ball is delivered by Dean Hammond. 34:32 The ball is delivered by Dan Harding, Callum Kennedy manages to make a clearance. 33:53 Danny Butterfield sends in a cross, save by David Lucas. 32:09 Sean Morrison concedes a free kick for a foul on David Connolly. Richard Lambert produces a strike on goal direct from the free kick, save by David Lucas. 31:07 Michael Timlin fouled by Jason Puncheon, the ref awards a free kick. Callum Kennedy takes the free kick. 28:10 The assist for the goal came from Charlie Austin. 28:10 GOAL - Vincent Pericard:Southampton 0 - 1 Swindon Vincent Pericard gets on the score sheet with a goal from inside the area to the top right corner of the goal. Southampton 0-1 Swindon. 27:08 Unfair challenge on Jose Fonte by Charlie Austin results in a free kick. Danny Butterfield restarts play with the free kick. 26:23 Free kick awarded for an unfair challenge on Sean Morrison by David Connolly. David Lucas restarts play with the free kick. 25:25 Inswinging corner taken by Jon-Paul McGovern. 25:05 Shot from 20 yards from Simon Ferry. Save made by Kelvin Davis. 24:35 The ball is sent over by Danny Butterfield, Callum Kennedy gets a block in. 20:48 Vincent Pericard produces a right-footed shot from just outside the box that goes wide left of the target. 20:07 Substitution Jonathan Douglas leaves the field to be replaced by Will Evans. 19:57 Danny Butterfield crosses the ball. 18:28 Free kick awarded for a foul by Jose Fonte on David Lucas. Direct free kick taken by David Lucas. 17:57 Free kick awarded for a foul by Jon-Paul McGovern on Morgan Schneiderlin. Direct free kick taken by Danny Butterfield. 15:33 Richard Lambert takes a shot. Morgan Schneiderlin takes the inswinging corner, Scott Cuthbert makes a clearance. Scott Cuthbert gets a block in. 14:03 Effort from the edge of the box by Jason Puncheon goes wide of the right-hand upright. 11:42 Dean Hammond delivers the ball. 11:36 Centre by Danny Butterfield, Scott Cuthbert manages to make a clearance. 7:42 The ball is crossed by Callum Kennedy, save made by Kelvin Davis. 5:23 Michael Timlin crosses the ball, Charlie Austin has a headed effort at goal from deep inside the area missing to the right of the goal. 4:44 The offside flag is raised against Richard Lambert. Free kick taken by David Lucas. 3:36 Unfair challenge on Jonathan Douglas by Morgan Schneiderlin results in a free kick. Jonathan Douglas produces a shot on goal direct from the free kick, Morgan Schneiderlin gets a block in. 3:03 David Connolly produces a cross, Callum Kennedy manages to make a clearance. 2:22 Free kick awarded for a foul by Radhi Jaidi on Vincent Pericard. Scott Cuthbert takes the direct free kick.